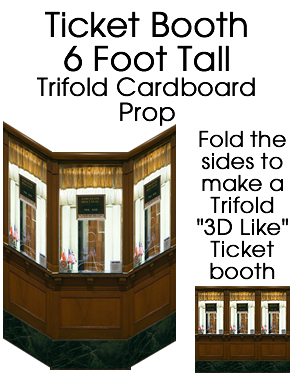 Ticketbooth / Box Office Cardboard Cutout Standup Prop - Dino Rentos Studios, INC. This ticketbooth assemble is minutes. Fold over the sides and it self Stands like a "Trifold". Add a Ticket Booth anywhere you need for your display. Uses Double walled cardboard for extra sturdy construction. Upgrade to a Glossy Finish for even more brilliant color.